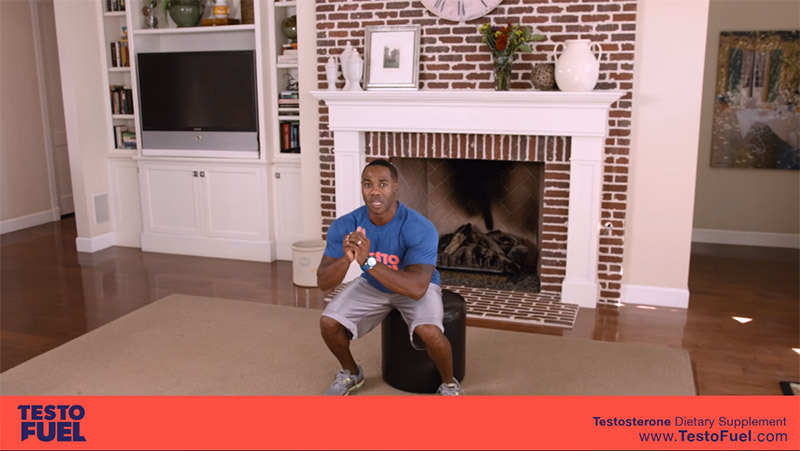 If you ever find yourself stuck at home and itching to go the gym, Brad from TestoFuel has the answer with these chair workouts you can do at home. In just three exercises. By working out these large muscles in the body, your body produces more testosterone to help with recovery. It’s a win-win for anyone looking to stay in-shape and boost their testosterone. This workout focuses purely on your upper body, in particular your chest. This is the chair-assisted Decline Chest Press. This is a great chair workouts at home for working the major muscles in your upper body. With these muscles under continuous tension, it encourages your body to release as much testosterone as possible to support the growth of these areas. Pulsating Lunges are one of the best body weight exercises for keeping your lower body constantly under tension, giving your legs an all over development. This engages a lot of the stabilizing muscles in your body and you should definitely be feeling the pump throughout your lower half. This exercise also demands a lot from your core to keep your back straight, and releases a lot of testosterone, due to the size of the muscles being worked. This is one of the harder exercises of this routine, but arguably the most effective for boosting testosterone levels – the Jumping Box Squat. Remember: The chair isn’t being used for support, it’s to give you an idea of how low you should be squatting. Resist temptation and do not sit down. Hover above the seat, keeping your leg muscles under constant tension. This will help work the muscles and release more testosterone when its time for recovery. There you have it, three challenging exercises you can do at home without the use of a gym or any fancy equipment – all you need is a chair and some serious dedication. Brad’s exercises are great for increasing muscle mass and strength, the high rep work promotes hypertrophy and overall muscle development. As an added bonus, working this major muscle groups provokes a higher release of testosterone throughout the body for faster recovery and growth. If you’re looking to recover faster from your gym sessions, increase muscle and improve your overall energy levels we highly recommend you try TestoFuel. This is our anabolic support complex that supplies your body with everything it needs to get the most out of your hormones. To find out more about how TestoFuel can help you, check out the ingredients page to learn more about each nutrient in TestoFuel and how it can supercharge your gains.